At last! On Tuesday I took delivery of a shipment of my book ‘999 Questions on the Rules of Golf’ and have sold 263 in Dublin to date. I have asked Robell Media to fulfil web orders for my book. I recommend that you order online click here for quick an efficient delivery. The comments that I have received so far have been extremely encouraging. 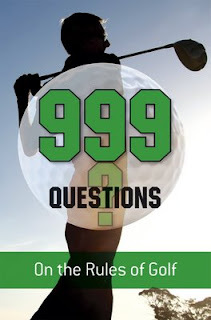 ‘999 Questions’ will definitely help any golfer to absorb the Rules of Golf without effort, and they will enjoy doing so. This is the perfect gift for all golfers, whatever their handicap. They have never have seen anything like it before. At £12.99 it’s a steal, and cheaper that a sleeve of three golf balls! Remember, here is the best place to purchase 999 Questions online.